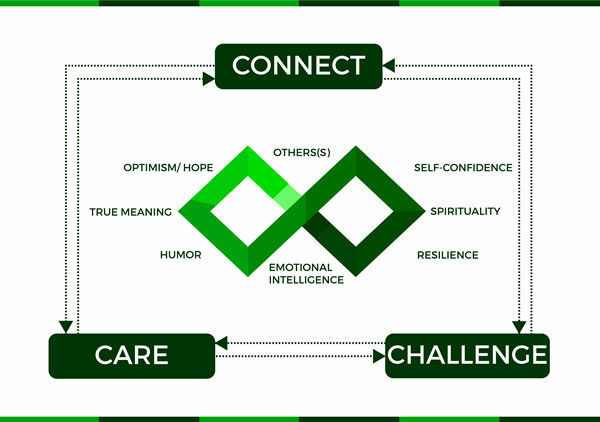 The resources in the OTHERS(S) model are Optimism/Hope, True-meaning, Humor, Emotional Intelligence, Resilience, Spirituality, Self-confidence, and OTHERS(S). Each of these resources is likely to act as a buffer to trauma and lead to growth following loss. Additional in-depth information on each resource, key message, and skills can be found in our workbook: Finding Your Way Through Sudden Loss and Adversity and Our Personal Growth Guide. People will typically take one of three paths following a loss. They may have a decrease in their functioning (dive), return to normal levels of functioning (survive), or experience an increase in functioning (thrive). The emphasis of our work, whether it is with an individual or an organization, is on thriving or growing through loss or adversity. However, our team uses a three prong approach to getting acquainted with loss: (a) proactive (preparing for loss before the event happens), (b) active (living with loss as the event happens), and (c) reactive (growing through loss after the event happens). Each of the OTHERS(S) resources has a definition, a key message, and a key skill. The foundational resources help us achieve greater self-awareness, increased emotional and physical well-being, and empower us to leverage our strengths and fuel our efforts to push through our hardships so we can continue on our journey of growth. The core resources concentrate more on our relationships with others, and how we interact and respond to loss and adversity. In essence, these resources are very visible in our everyday interactions with others. Definition: Self-Connect is a foundational resource that is about raising your self-awareness so you can understand yourself and understand the people around you. The process of self-connecting facilitates trust between you and others, and encourages you to bond with people on a deeper level. This in turn enables you to develop your resources to grow through loss and adversity. Key Message: Build your self-understanding and understanding of others. Key Skill: Journal writing. By becoming more aware of your personal thoughts, feelings, and behaviors, you can gain a clearer understanding of yourself and those around you. This facilitates resourcefulness and personal growth. Definition: Self-Care is foundational to building the OTHERS(S) resources. Care emphasizes having empathy for yourself and helping others help you. It is a process that includes practicing self-care and healthy ways to heal and grow through loss and adversity. Key Message : Practice self-care. Key Skill: Reflection. By taking time to listen to and accommodate your physical and emotional needs, you can better equip yourself to not only maintain ground through difficult times, but also thrive despite challenging obstacles. Definition: Self-Challenge is the last foundational resource needed to build the OTHERS(S) resources. Challenge places emphasis on finding your inner strength, even in the most painful times of your life, to be brave enough to take steps toward healing and growing through your loss and adversity. Key Skill: Challenge affirmations. By thinking about how you can achieve your personal goals, and providing specific reasons for your success, you can increase your self-confidence, as well as your ability to take on challenging events in your life. An example of this would involve making a list of positive statements about yourself. Definition: Optimism is your ability to develop and maintain a positive attitude and hope even during challenging times. Key Message:You control how positive you are in any given situation. The more often you have a positive outlook, the more often you will have positive feelings. Key Skill:Finding the positive and refocusing. Definition:True meaning is your ability to make meaning of your losses/adversity and find purpose for the future. Key Message:Finding meaning related to the loss of a loved one can provide you with peace of mind. By creating purpose in your life, you will be more motivated on a daily basis. Key Skill:Self-Questioning. You can develop meaning and purpose by asking yourself positive and purposeful questions. Definition:Humor is your ability to laugh and use humor to lighten the load of loss and adversity. Key Message:For years researchers have reported that laughing is good for your psychological and physical health. Laughing breaks down barriers and facilitates connections among people. Definition:Emotional intelligence is your ability to be aware of your emotions, connect with people, read emotions in others, and communicate your emotions to others. Key Message: The more aware you are of how you feel and how others feel, the better you will be able to respond in healthy ways. Your feelings are the most powerful part of you. Get to know them and how they affect you, because they can be a tremendous resource. Key Skill:Resilience andemotion coaching. Become aware of your emotions, understand them, and then channel them into positive actions. Definition:Resilience is your ability to adapt, bounce back, and respond with strength to adversity, loss, and challenge. Key Message:You have the ability to bounce back, just like a basketball. The journey through life in general has a lot of hills and valleys and twists and turns, but you don’t have to get stuck or be lost. Key Skill:Self-Coaching. Your way of communicating with yourself and teaching yourself to bounce back. Definition:This resource can only be defined by you, as it is the most personal of all resources. An example of a personal definition is: the level of connectedness to people and the surrounding world. Spirituality may also be defined as the inner spirit and passion for relationships with others. Key Message:Spirituality is what gives you the strength to live with loss and move forward. Everyone has his or her own sense of spirituality. Key Skill:Leveraging your spirit. Personally define the passion within you that encourages you to thrive, and use it when ever possible. An example of this could be: Personal Definition: connectedness I share with others – Application: Try to strengthen bonds and deepen the roots of my relationships I share with others. Definition:Self-confidence is your belief in yourself and your personal resources. Key Message:Self-Confidence is the key that unlocks most doors. If you believe in yourself and your abilities, you increase your chances of succeeding tremendously. Definition:OTHERS(S) ties all of your personal resources together and emphasizes relationships. This resource is the most important by far. It is your ability to build relationships in your social-network, and heal through helping others. Key Message:The world revolves around relationships. The more positive relationships you create, the more happiness for yourself you will create. Key Skill:Hold the Door for Others. 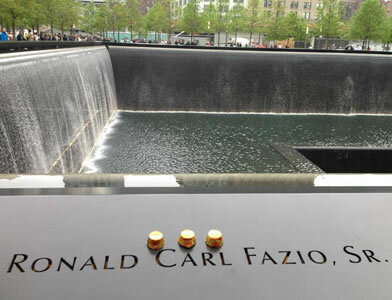 By reaching out and connecting with others, people can often heal and grow through loss. Put this skill into action by volunteering to help someone in any way.